Cannondales, especially newer ones, are not exactly a rare breed. Tune in to any Grand Tour like the Tour de France, for example, and you would spot them in the peloton beneath some dudes with massive quads. You do not even need to turn on the tube to encounter one of these oversized aluminum or carbon beauties; likely, at least one buddy of yours may be pedaling an example in your local club ride. Yet my now twenty-four-year-old Cannondale R500 with red 3.0 frame and white aluminum fork is still unique enough that I always do a double-take when I see one. Since purchasing it in 1993, this has only happened, oh, four or five times. The feeling is similar to when I once met someone who was using a Nokia Lumia 900—the very first smartphone I had—sporting a striking unibody polycarbonate design and gorgeous Windows Phone 7 “Metro” user interface that never gained much traction in the marketplace but was nevertheless capable and delightful. The most recent rendezvous with the twins, triplets, and quadruplets of my Cannondale R500 (affectionately called Canny) was in Central West End in St. Louis. I was walking through the Medical Center of Washington University when the unmistakable paint scheme and smoothed, filleted TIG welds of this classic made me crank my head around. Upon my second pass of this bike U-locked to a commuter bicycle rack I snapped the featured photo of this post. Frame: Mine is 53 centimeters. This one looks smaller, like 50 centimeters. Handlebar tape: Mine was white (cork, I think), not black vinyl. Pedals: Mine had silver Shimano toe clips and straps and accepted cleats, not black plastic cages. Rims: Mine had silver box-section Mavic MA2s, not Arayas. But it did have 32 spokes on both wheels like the example below. Tires: Mine had Michelin Select (?) 700x23c tires that retailed for $7 at the time. (This is when Michelin’s top-of-the-line tire, the Supercomp HD, retailed for only $22—not $70 like the high-end tires today.) The R500 below has a Schwalbe dual-compound tire that is different from the front and is certainly a replacement. Saddle: Mine had a black Vetta that tore pretty quickly. This one has a black Selle San Marco Ischia that is likely a replacement. I’m actually amazed that this bicycle still has so many of its original components—much like the 60-centimeter Cannondale R500 I saw in Fort Collins in 2013. The only OEM parts Canny has after nearly 35,000 miles are the frame, fork, and handlebars as I had replaced everything else. 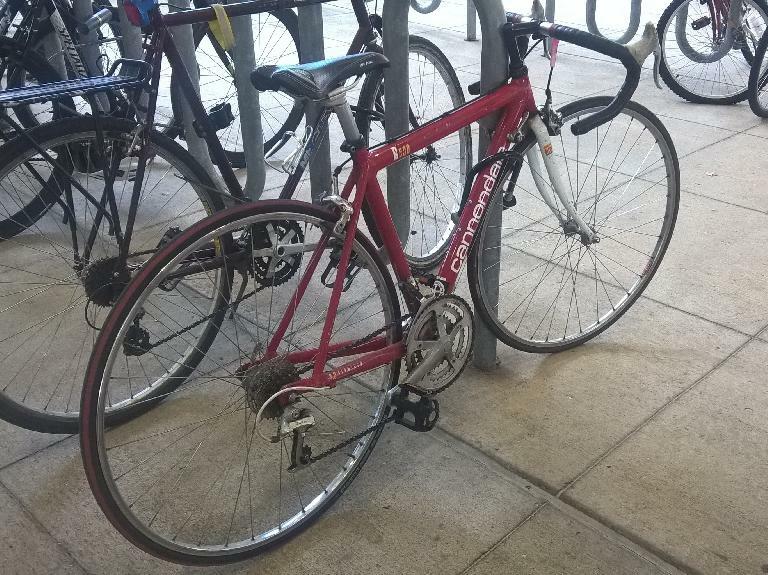 There must be more red and white Cannondale 3.0s out there. If you have one, please drop me a line or leave a comment below. 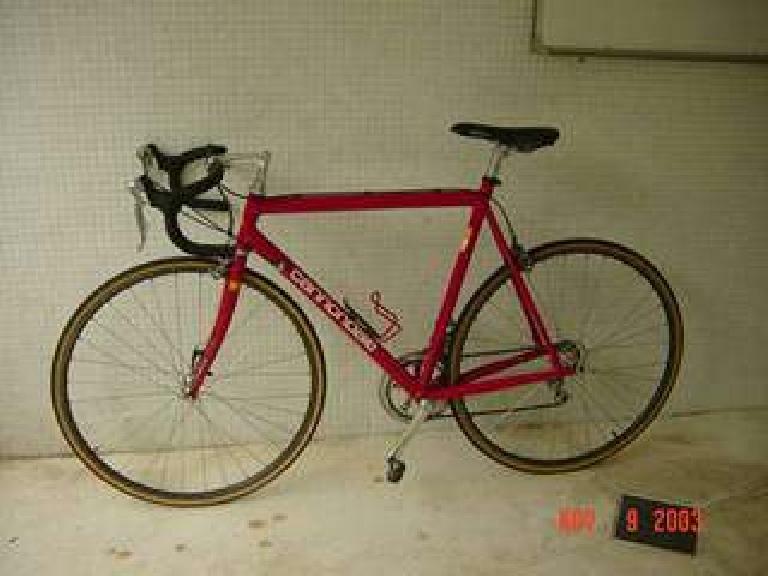 Thanks to William Tsui for sending me a photo of his former red Cannondale 3.0—from Hong Kong no less! His explanation of how he acquired the bike is below. 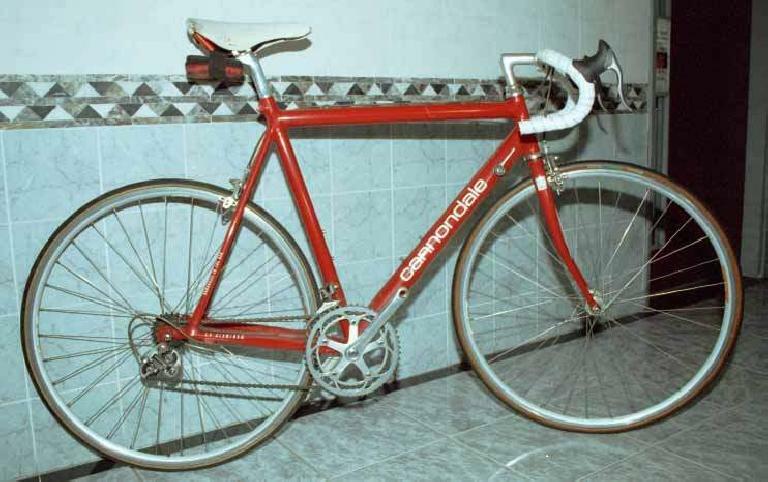 I had had a red Cannondale which I bought in 1993 in Hong Kong. The shop, Flying Ball (the shop that got Scotsman David Millar into bike racing), built the bike with a CADD 3.0 frame. And I remember I spec’ed full Ultegra components, Mavic Open 4CD rim, Michelin Hi-Comp tires, Turbo saddle on it. Unlike Canny, it has red fork. Unfortunately I sold it in 2007 because I found its ride too harsh. I did not take many pictures of it. There are some low resolution pictures and a very unflattering pic of it being a resting place for clothes hanger (my mom did it). About Millar, if you read his book he did mention Flying Ball bike shop. He was a teenager living in Hong Kong at that time when his father was pilot for Cathay Pacific. He attended high school in Hong Kong. My riding buddy also had a red Cannondale. I am not sure whether it was CADD 3.0 frame though. He bought it in 1992 at Flying Ball and as you can see, it used downtube shifters (my bike has STI). He said it had a mix of Campy, 105 and 600 components. He sold the bike some ten yrs ago. It looks the same size as mine (53 cm) but has a red fork and seat collar. It also has “Handmade in the USA” on the seatstay and lacks the model number on the top tube.